Crew arrived over the target and dropped its bombs. Light anti-aircraft fire was experienced as the bombing run was started. Anti-Aircraft fire increased with no enemy fighters in sight. A heading for the flight back to England was taken after the bombs were dropped. Four specks appeared into the sun which quickly proved to be enemy fighters. Lt Plocher's B-17 was hit by 20mm cannons knocking out the #1 and #2 engines and damaging the #3 engine. Lt Tyler (CP) and Sgt Stevenson (LWG) were hit and killed instantly. A fire started in the radio room that was extinguished by T/Sgt Friese (Radio). An explosive 20mm entered the B-17's nose, hit the armor plate, exploded and shell fragments penetrated the backpacked parachute and wounded Lt Corwin (Navigator). 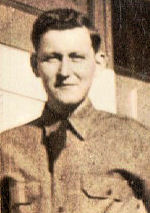 S/Sgt Tornow (TG) was also wounded. Two enemy fighters attacked the aircraft. The B-17 was turned into the path of the two attacking fighters. One was shot down and the other flew away. 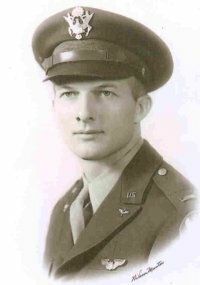 Lt Plocher then put his B-17 into a dive and leveled off at 500 feet above the water. All non-essential loose equipment, guns, etc. were thrown out to lighten the load. With three engines shut down Lt Plocher decided that the best thing to do was to maintain the flight heading back to England and hold his altitude. The B-17 was flown for about 40 minutes when the #4 engine started to belch black smoke, indicating that it was over-heated and losing power. The crew was commanded to take their ditching positions and brace for impact. The B-17 was maneuvered to a large swell and settled down on the water. It was a good landing, one that you never get in practice. 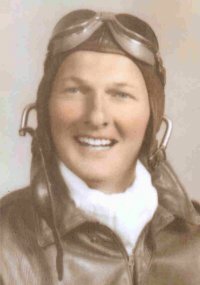 Lt Plocher crawled out through his left cockpit window and down on the wing. His life raft gave a hissing sound letting him know it had been punctured by three bullet holes. He reached into his pocket for handkerchiefs that was enough to plug the holes. He then hooked the pump up and inflated the raft. He immediately moved the raft off the wing and got in. It stayed afloat for about two minutes and sank with the bodies of Lt Tyler and Sgt Stevens. Lt Plocher reached a life raft where Lt's Corwin and Kahlden, with their life jackets on, were bobbing in the water. Lt Plocher boarded the life raft and pulled the other two aboard. They then spotted the other life raft with five crewmen aboard. They managed to tie the two rafts together. As the sun began to set, the crew heard an aircraft. A German fighter spotted them and flashed its landing lights before veering away. Around midnight, all of the crew shivering from the cold and wet after floating for 12 hours, saw a light sweeping the water some distance away. A loud and clear English speaking voice asked who we were. Again the voice spoke and was recognized as having a German accent. The German vessel approached the rafts and lowered a 30-foot ladder. 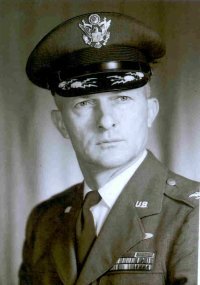 Lt Plocher was the last crewman to make the climb. The seven surviving crewmen spent the next 26 months as POWs. Wounded Tail Gunner, S/Sgt Tornow, was repatriated by the Germans.